Sign found at Plainfields Station. No Bass ale, though. There’s a sorry, sorry tale I have to tell. It’s a saga of English pride fallen into a puddle of shame, of mightiness fallen and foul deeds. It’s a story of British spring weather in normally warm California, and the best and the worst of beers. But first, a little history. 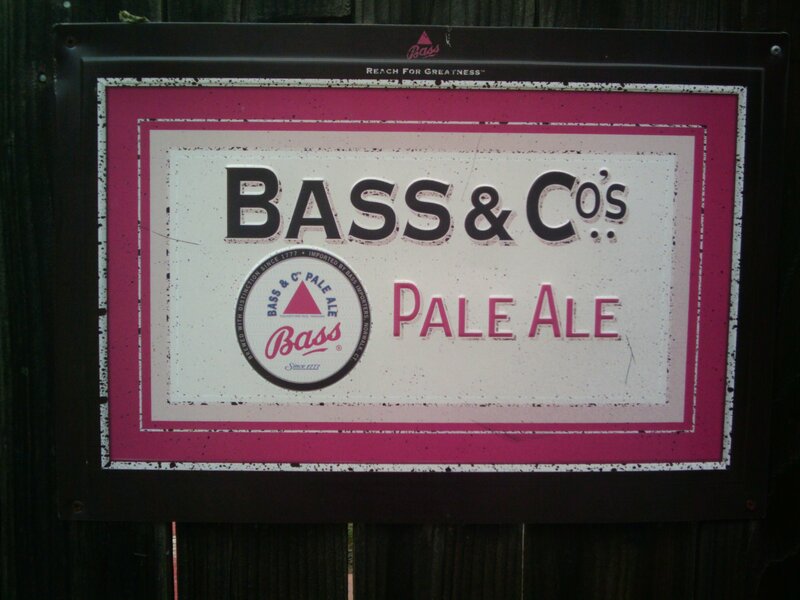 Bass Pale Ale has been brewed since God were a lad, in Burton-upon-Trent in the noble Midlands of England. In some manner and form, this beer has been in production since the eighteenth century, and Bass properly call it “the original Pale Ale”, and it probably was. The water in Burton was perfect for this slightly hoppy, light ale. 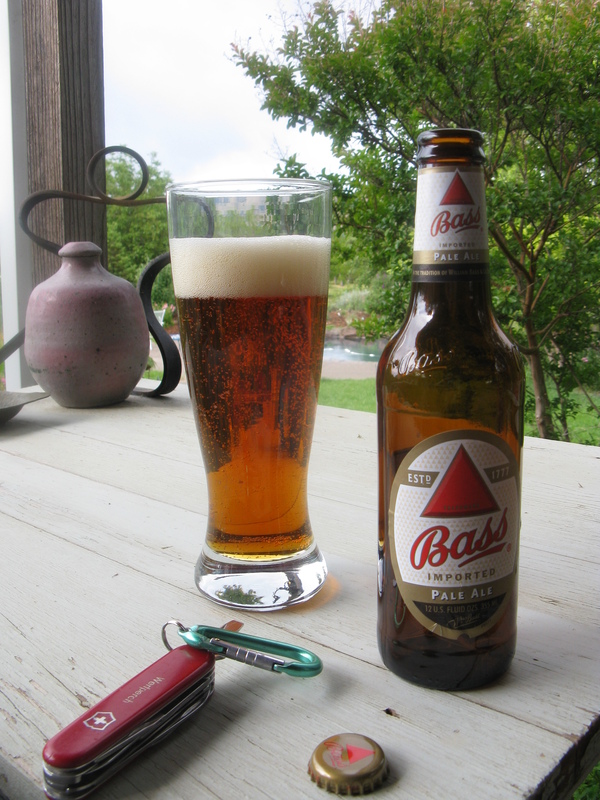 So I recall Bass Pale as a cask beer in old English pubs, drawn slowly from the wood (cooled only by a damp towel) – it was a succulent beer, bitter and summer-fragrant with enough maltiness to balance it out. The head was thin, aye, but the experience was heavenly. These were the halcyon days for the English drinker, before total science stepped in and the yeasty brews of yore were replaced by the consistently mediocre, gassy beers that were Watney and bloody Double Diamond, and Boddingtons was still brewed by grizzled craftsmen with Mancunian accents, and was genuinely creamy-headed and yummy. For now, I’m please that Bass is still about, although InBev have taken over. This is for me still the Pale Ale that others must be measured by, and despite the export beer being made in sterile stainless vats, doubtless somewhere in bleedin’ London, it still has some of the old magic. I’m drinking this one in the Capay Valley, on a mid-spring day that looks and feels more like an English spring day. It’s overcast and cool, and I imagine myself outside the Queen’s Head or Fox and Goose in some picturesque English village, replete with quaint and tired after a long hillside walk. It’s still good, despite the bottles being hauled five thousand miles through goodness knows what. Still a little bitter without the hops taking over (and these days in a pale, that’s increasingly rare) and sweet enough to give one the strength for the final push to walk home. It gets a B from me, mostly for still being refreshing, and whilst there are many excellent (and better) pales around, it’s still a favourite of mine. Just allow me my moment of nostalgia, and yes please, I will have another. So here, for me, is a real blast from the past – one of the top best-selling beers in the UK, if my sources are correct. Not that I ever drank much of it, any more than I drank Watney’s Red Barrel when that was one of the Top Three. 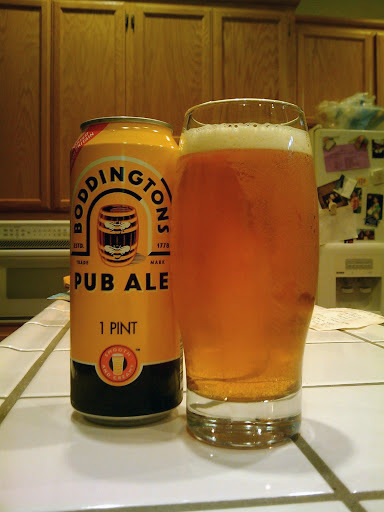 I remember the Boddington name more from their 1990s TV adverts than from their beers (an example of their ads you can currently find here).